When it comes to residential purchase-sale contracts, sellers are required to disclose known defective items / facts that materially affect the value of the property. 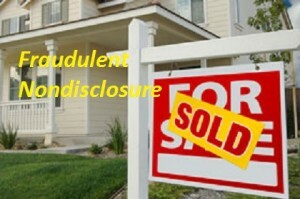 Such residential contracts routinely include language that the “Seller knows of no facts materially affecting the value of the Real Property which are not readily observable and which have not been disclosed to the Buyer.” If such fact is not disclosed to the buyer, the buyer may have what is commonly referred to as a fraudulent nondisclosure or concealment claim against the seller (former owner) or a Johnson v. Davis claim named after the Florida Supreme Court opinion that recognized fraudulent nondisclosure claims. Many sellers try to hang their hat on the fact that the residential contract contains an “as is” provision such that they are selling the property “as is”. Certainly, this is good language. However, an “as is” provision in a residential purchase-sale contract will not waive the duty imposed on the seller to disclose known items / facts that materially affect the value of the property and which are not readily observable. Solorzano v. First Union Mortgage Corp., 896 So.2d 847, 849 (Fla. 4th DCA 2005). 4. the buyer must establish that the seller failed to disclose the defect to the buyer. Jensen v. Bailey, 76 So.3d 980, 983 (Fla. 2d DCA 2012). If you believe you have a fraudulent nondisclosure claim, consult a lawyer that can best assist you in (a) proving your claim based on the required elements and (b) understanding your damages associated with the nondisclosure. Typically, this will require engaging an expert to testify as to the costs to repair the undisclosed defect(s) / fact(s) that materially impacts the value of the property. This entry was posted in Construction Defects, Johnson v. Davis and tagged as is contract, fraudulent concealment, fraudulent nondisclosure, Johnson v. Davis, residential purchase-sale contract by David Adelstein. Bookmark the permalink.